If there are more stereotypically Pittsburgh names for a couple streets than Brabec and Voskamp, point this blogger to them. 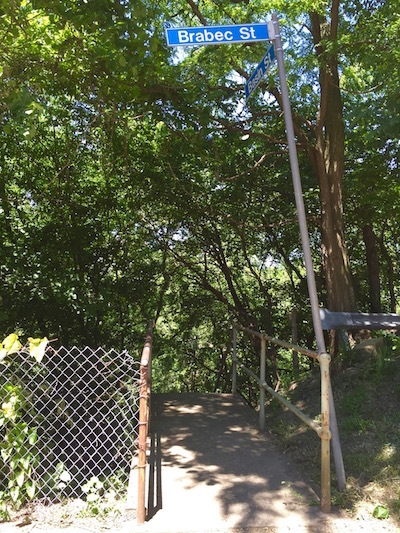 That these two short residential ways (in Troy Hill and Spring Garden, respectively), should be connected by a picture-perfect set of city steps is all the more apropos. Action, scene, cut, and print. Tripping across a new set of city steps is no great feat–there are hundreds of them after all*. But randomly arriving at a stretch as spectacular as the Basin Street steps doesn’t happen every day. 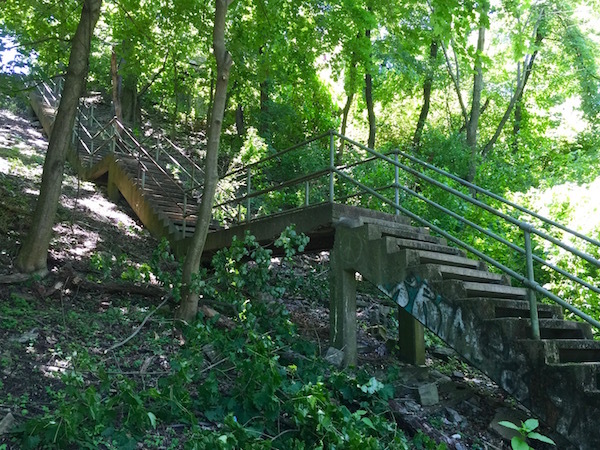 The couple hundred individual risers that connect these two near North Side neighborhoods have everything the step trekker and urban daydreamer could possibly hope for–theater, tranquility, history, and mystery. Steps, by their altitude-adjusting nature, almost always offer something in the way of rewarding city vistas and Basin Street is no exception. 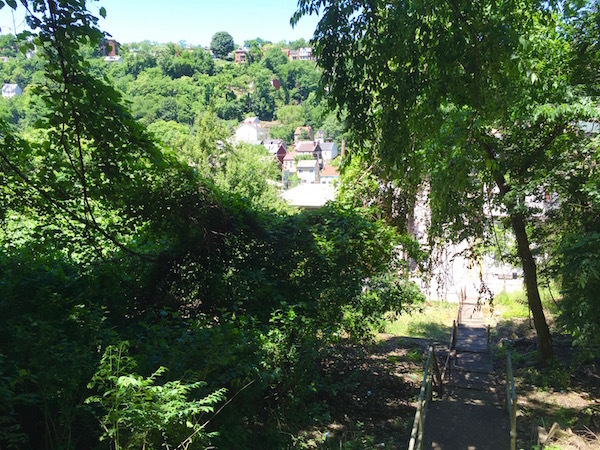 The view from the very top (at Brabec Street) is shrouded in trees, but multiple points along the way offer terrific angles through the branches down to the Spring Garden bottoms below and up into the lush hillside of City View/Spring Hill above. Aside from the surround-sound bird chirping and song-singing–plus one indefatigable opossum loitering in a Voskamp Street back patio–not a creature was stirring in or around Basin Street on the day we visited. It is this gentle peace right in the center of the city that makes a great set of steps so special. 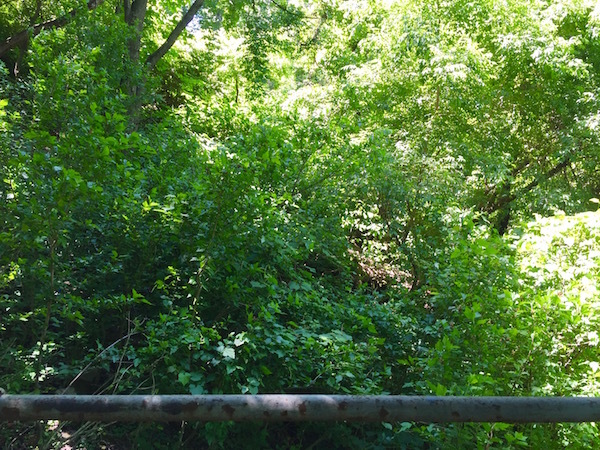 Basin Street has its requisite signs of humanity–foundations for long-gone homes off to the sides and no small amount of litter left by teen drinkers and hill campers–but it generally has more of the feeling of being way out in the woods. It’s fair to say that this particular wood still features the sounds of weed whackers, dudes working on cars, and distant classic rock wafting through branches–but a wood nonetheless. 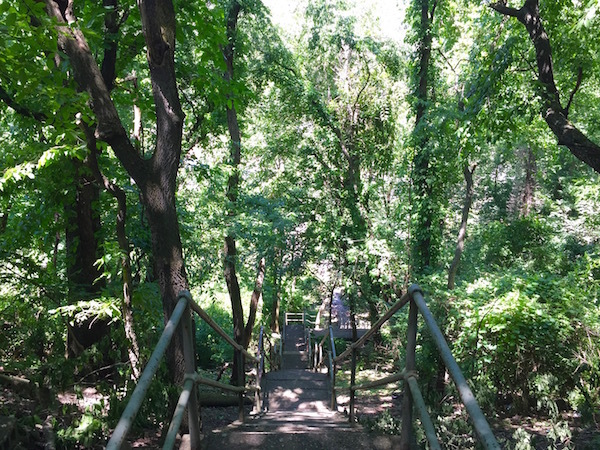 Like Tolstoy’s happy families, each story of the city steps is in a sense the same: a wonderous artifact of urban infrastructure still exists, relaxing in repose on and under-visited city hillside. Nature, time, and tide reclaim as much as the Pittsburgh D.P.W. allows. The occasional pedestrian saunters through, but they exist mostly in a time of their own. On the other hand, though, each passage of steps–at least the really glorious, long, secluded ones like Basin Street–offer their own unique experiences: different views, twists and turns, different high, lows, and end points. Rising Main, it ain’t, nor does it have the clusters of great steps like Fineview or the South Side Slopes, but this little backside of Troy Hill is well worth the trip. Big ups to the Basin. 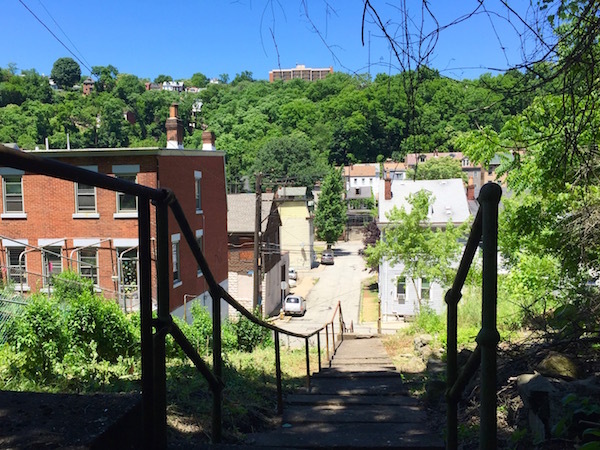 * There is no official number, but the estimate is somewhere around 750 sets of public steps in Pittsburgh.